The PrimoGraf is a hand-cranked machine which uses wooden gears with prime numbers of teeth to produce a nearly infinite array of intricate drawings. The various patterns are achieved by connecting the linkages via different holes. Check out the video to see what I mean. It's mesmerizing! The PrimoGraf is a well-designed set made of walnut, basswood, and solid brass. 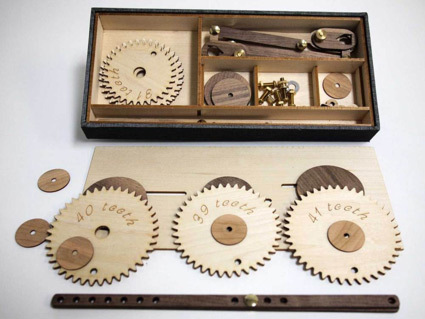 It comes with 7 gears, 2 sets of rods, 2 pen-holders, and all the hardware required. You can order the PrimoGraf from LEAFpdx. that you posted it at the same time ! And the source is not very popular. Very cool! And you're right it is mesmerizing! Genius work there.